The idea of writing this article only came to my mind after I did complete soundproofing of my car. When I was searching for legit information on the internet, I couldn't find all the information in one place. This is a small effort to help anyone looking for soundproofing car by sharing my experience. First of all, you need to ask yourself, do you really need to soundproof your car? If you aren't aware of the soundproofing concept, then please read my last article. In this article, we will talk about some of the best sound deadening materials for cars available in the market. My criteria for selecting the top ten sound deadening materials include the online feedback, cost-effectiveness, and the ratings available across the e-commerce platform. Not all, but most of these materials, I have personally used. Currently, the market has evolved and finding a product with the right features as well as the right price is a tedious task. You go to any e-commerce website and, type the product you are looking for, and the search result will show you an endless number of products making you totally confused. 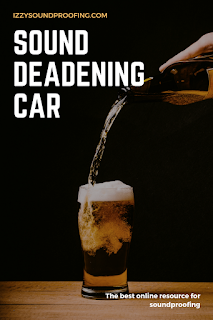 Sound Deadening Car: What does it really means? My first advice to you is "Listen to your car". Even before you think of going for the sound deadening car, remember that all the sounds shouldn't be ignored. If you are hearing some sound that is unique and redundant, then please consult a mechanic else you will have to face a severe problem that no soundproofing technique will ever be able to solve. The advice comes from my personal experience. After DIY soundproofing my car, I started hearing some redundant sounds that I had never heard before. I ignored the sound, and it costs me a lot. If someone commits you, that your car can be 100 percent soundproof, then he is trying to fool you. There isn't any technique available in the market that can guarantee you 100 percent sound deadening. Sound deadening a car simply means prevention of unwanted sound from entering the car. Some of the common unwanted noises include the trunk, hood, doors, panels, license plates, and tail lights. Trust me, If you have the right soundproofing material, then reducing the unwanted noise is easy. In the layman language, a sound deading car means to minimize the irritating, unwanted sound inside the car. As a car owner, we want to dampen the irritating, and annoying noise. Soundproofing a car is much easier as compared to soundproofing a room or an office. Right now, there are some electric and hybrid cars available in the market which is very close to 100 percent soundproof. In case you want to go DIY way, all that you require is the right dampening material and some weekend time. Dampening barriers, coatings and deadening material are the essential components of soundproofing a car. You can apply these materials at windows, doors, floors and so on. You can easily figure out the difference when it comes to stereo sound and, in-car conversation etc. Before we start discussing the top ten sound deadening materials for the car, I am sharing you the process that I followed to soundproofing the car DIY way. What to look for in a sound deadening material? Before you start the process of the sound deadening car, it's very important for you to understand the difference between soundproofing materials and sound absorbing materials. These materials are generally used to reduce the noise in the ecosystem that you are planning to soundproof. For example, if you are planning to soundproof a car, then the noise will be of car system beeps, car doors, trunk rattle, cabin noises etc. 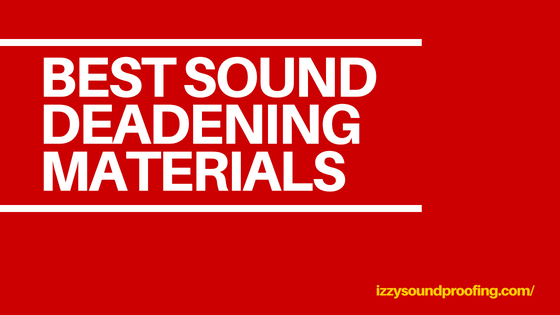 When it comes to soundproofing a car, mostly four types of materials are used. Damping Mats: This is the most common of all the materials and, it comes first to the mind whenever anyone thinks of soundproofing. Mostly, these damping mats are used to cover the panels. Insulation: The insulation materials are thick layers of fibers which are placed underneath the foam shield. The insulators are great sound absorbers. Foams: They are used for eliminating sound reverberations. They come in sheets and placed on the floor of the cabin in cars. Sprays: I can say that this is one of the least used methods, and are mostly used when we can't do regular matting. Thickness: It has been found that the thicker the sound insulator the better is the performance. Size: The size of the material is mostly equal to the area that you want to cover. Are you aware of the steps involved in sound deadening of a car? It's a simple fix and doesn't take a lot of your time. You can use Dynamat, a foam shield, which prevents unwanted and irritating sounds entering into the cabin by absorbing it. The foam needs to be placed inside the mat of the front two seats. I personally used FatMat, and till now I haven't faced any problem. You don't need to possess a special skill to perform this task. Trust me, Guys, if I can do it, then why can't you? You have to simply remove the floor mat, and apply the Dynamat or its variant on the floor. In any way, it will not take more than an hour. The foam shield consists of adhesive on one side so you will not have to even mess with the glue. When I was doing the soundproofing of my car, I had a question in my mind that how much sound reduction is possible using these foam? I hope you must be having a similar question, right?. The answer is very simple, and generic in nature. In fact, you have to take a call that how much reduction in the sound you want. It's advisable to place these foam shields on the rear floor also, to reap the maximum benefits. The output of this process also depends upon the loudness of the car at the beginning. If you are satisfied with the soundproofing done in step one, then you can continue with it else you need to add reflective insulation under the foam. At first glance, you may feel that this tinfoil like insulation will not be very effective, but once you have applied it under the foam, you can feel the tangible difference. It's definitely a useful sound deadening material to be added to your car. It blocks 98 percent of the heat coming from the floor panel into your car. Check the product here, I bought it because of great customer reviews and ratings. Trust me, you will not regret by trying this product. It is an extremely lightweight and flexible material. The process is simple, and will not consume a lot of your time. Buy 3M General Trim adhesive, and spray it on the floor of your car. Now, put the reflective insulation on it, and let it dry fully. Once it is dry, put the foam shield above it, and you are done. Don't forget to give the feedback about your experience by commenting in the comment section. The science behind the soundproofing of your car is very simple. As discussed, the sound deadening materials basically either absorb the unwanted noise or reflect the unwanted sound waves. Since we want to apply these materials inside the car, so we will be using insulating materials which can absorb unwanted sound waves. According to me, the best place to apply the foam and insulating material is the floor of the car. I only applied it to the floor of the front two seats and it really worked well for me. In case you are looking for a perfect sound deadening car, then you can apply the insulating material on the floor of the back tires. The process is the same. Some people even prefer to soundproof the car doors. In case you are the one, you can try it out. I will not recommend you as it will incur an additional cost. This process is very important and even a small leniency can put all your efforts to zero. You need to check the car for any hole or leakage. For example, if the windows of your car are closed and even someone speak loudly, you will not hear the voice. But at the same time, if there is a hole in the window, you can hear the voice very clearly. The point which I am trying to make here is the importance of that small hole which can make all the difference. So, to make your car completely free from irritating and unwanted sound, you have to keep a check that there is no hole anywhere in the car. You can check the performance of the soundproofing by downloading a decibel meter app for your phone and checking the reading before and after the sound deadening of your car. Generally, soundproofing is quite visible in the older cars as compared to newly bought cars. In the older cars, you can find approximately 40 % sound deduction as compared to 12% to 17% in the newly bought cars. 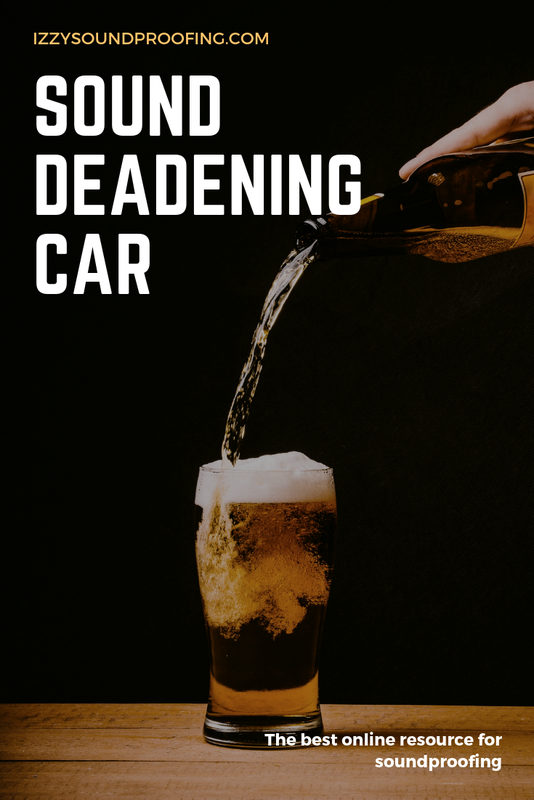 These are tried and tested methods and I am very sure it will help you sound deadening your car. Let us know your way of the sound deadening car, and the materials you used for this purpose.